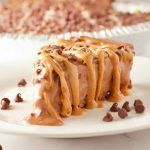 This Chocolate Peanut Butter Ice Cream Pie takes just 4 simple ingredients and 10 minutes to make! A non-dairy and free from animal products dessert that everyone can enjoy for the holidays. This post is sponsored by Häagen-Dazs. I was compensated for my time. All opinions and thoughts are my own. Thanks for supporting brands that make Sinful Nutrition possible! I don’t know about you, but when it comes to important decisions, I’m indecisive. Stocks or bonds. Health Insurance policies. Radio stations. Desserts. It’s all too much! Oh, desserts. I would say I have a controlled sweet tooth. I always crave something sweet after a meal, but it takes only 1-2 bites to satisfy me. I’m the one who makes everyone else order dessert, just so I can have a bite of every option. The holidays are no exception. Mr. Rob is finally catching on to my games. You should see me during the holidays. A sliver of each pie. A spoonful of each ice cream. A bite of fudge. Half a cookie. And a partridge in a pear tree. So I made the executive decision to help myself out. And combine the best of the best in the dessert world into one. Peanut butter, meet chocolate. Ice cream, meet pie. And they lived happily ever after. When I heard about the Non-Dairy Collection from Häagen-Dazs, especially the Crunchy Peanut Butter flavor, I knew I’d be all over that. The Häagen-Dazs Non-Dairy Collection leverages star ingredients (like cocoa butter and peanut butter) for a creamier and truer taste. Instead of substituting milk with almond milk, coconut milk, or soy milk, they use the fat from the core ingredient (like peanut butter) which is what gives it the “truer” taste. As a dietitian and #OneMorePlant founder, I know how important planning, taste, and nutrition are when it comes to incorporating more plant-based foods into the diet. I love seeing more and more companies like Häagen-Dazs support this motion, and offer options for every type of diet and lifestyle out there that taste delicious, are simple, and are plant-based. Even if you aren’t strictly vegan or vegetarian, Häagen-Dazs does have plenty of options to simply add more plant-based foods into your life. Now that’s some #OneMorePlant livin’! Ice cream isn’t excluded either. Häagen-Dazs has rolled out 8 non-dairy varieties, and will be adding 2 MORE to the collection next year. If it’s anything like this Crunchy Peanut Butter Non-Dairy TRIO CRISPY LAYERS flavor, I am more than ready for 2019. Shop the sales: I snagged a major deal on two of these pints, so take advantage of them when they come around! Use up old graham crackers: If you have a box of leftover chocolate graham crackers, use them up to make your own graham cracker crust. 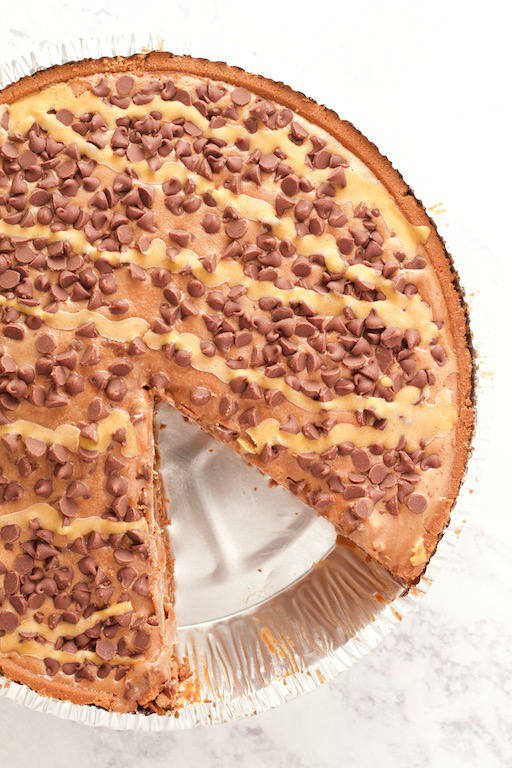 This Chocolate Peanut Butter Ice Cream Pie takes just 4 simple ingredients and 10 minutes to make! 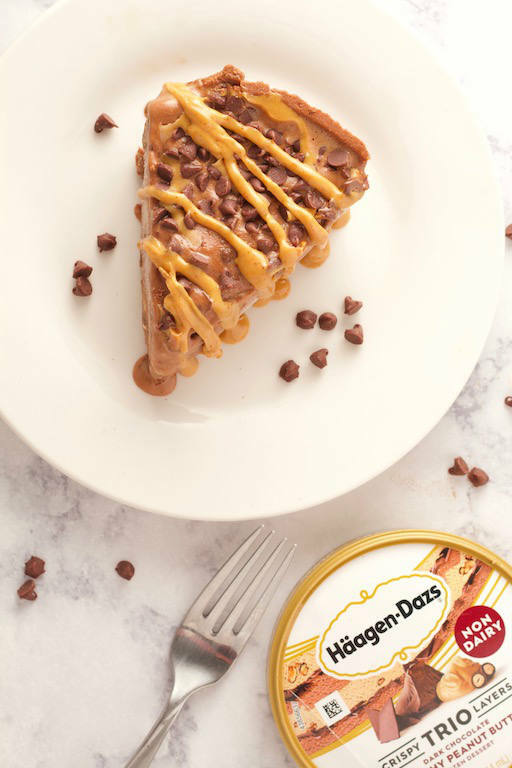 A non-dairy dessert, made with Häagen-Dazs Crunchy Peanut Butter Non-Dairy Trio Crispy Layers Frozen Dessert, that everyone can enjoy for the holidays. Let ice cream thaw on counter until softened. Spread evenly in graham cracker crust. 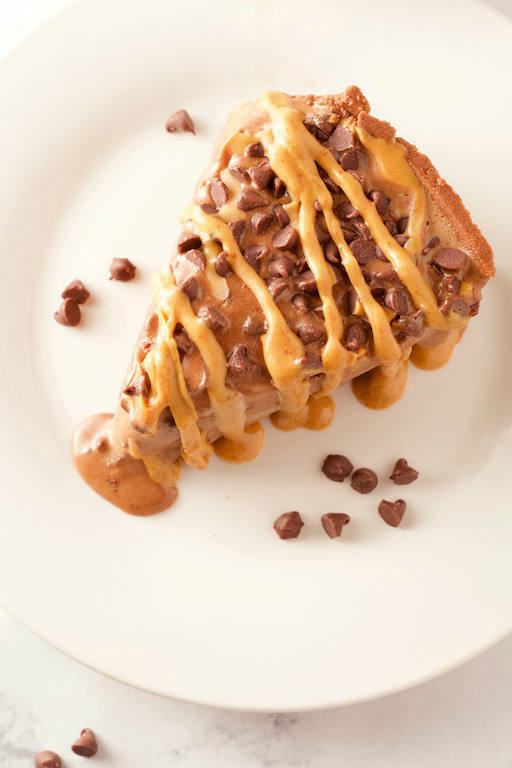 Top with chocolate chips, and drizzle with peanut butter. Return to the freezer for at least 2 hours, or until firm. Cut evenly into 8 slices, and serve. Pin this recipe to your ‘Dessert’ board! What’s your favorite way to add more plant foods into your diet? Would you rather have pie or ice cream? This is a sponsored post written by me on behalf of Häagen-Dazs. How delicious does this pie look?! What a great treat! What a delicious and easy sounding dessert! Can’t wait to to try this out. I think I’m officially obsessed with this pie!! 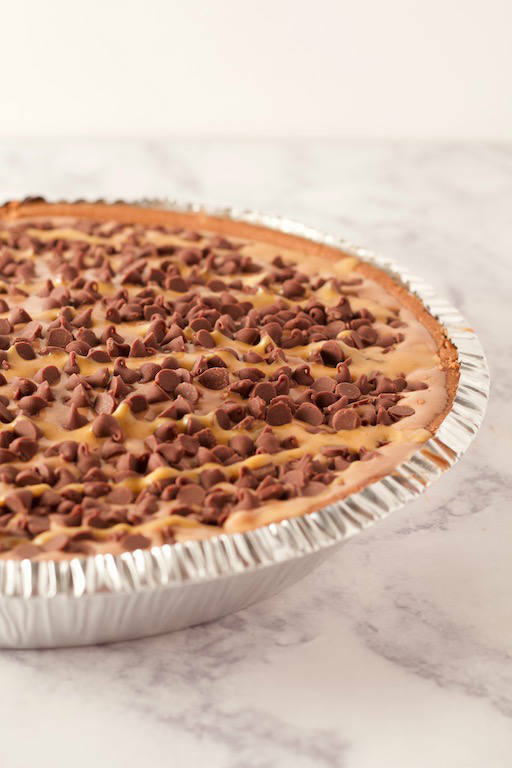 This pie looks so good, I love peanut butter and chocolate! Didn’t realize Haagen Daz had a nondairy line! I love this! Ice cream pie is just the best! 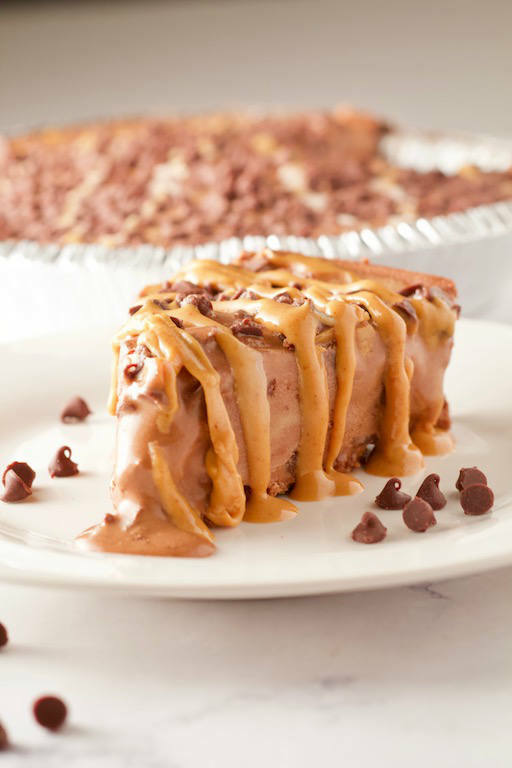 Peanut butter pie was a favorite of mine as a child! I love the addition of chocolate here and I know my kids will like it too!!! Oh my gosh, this actually looks pretty easy (and delicious!). Sounds like the perfect NYE dessert! This pie looks sinfully delicious! 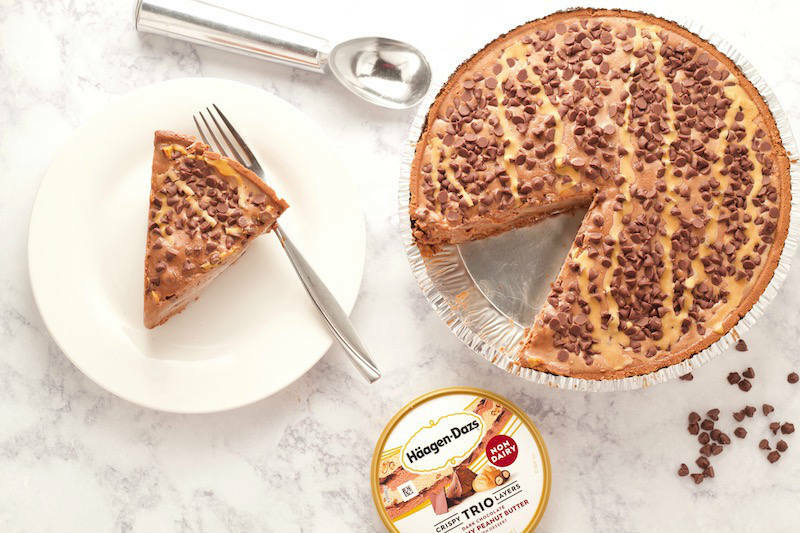 I have had my fair share of peanut butter pie, but not an ice cream version. This has to happen immediately – my whole family will LOVE it! 4 ingredients and 10 minutes?! How is that possible? This looks waaayyyy too good for that! Awwww man. I really wish it only took me 1 -2 bites to satisfy my sweet tooth! Pretty awesome. This looks actually amazing, and with ONLY 4 simple ingredients and 10 minutes to make, this is a must-have for visitors. Even better that my friends who are non-dairy and prefer to eat free from animal products, can actually eat this for the holidays. 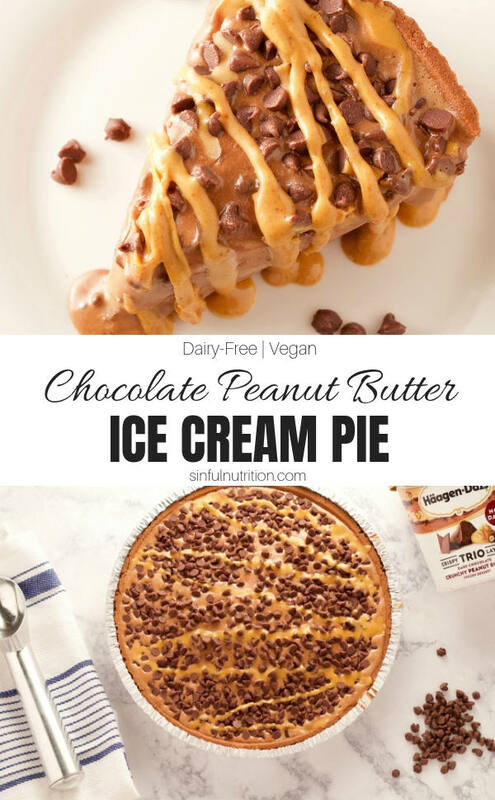 Oh my, I am literally drooling over this dairy free ice cream pie. It looks so creamy and sooooo delicious. Haven’t tried the dairy free Hagen Daaz ice cream yet, will have to look out for them. This pie is perfect for our family gathering! This looks like a new favorite in my family! Omg I need this in my life! My mom used to make this really simple ice cream “cake” with crushed Keebler fudge graham crackers at the bottom, ice cream and then fudge on top. Love this spin! So classic! I’m all about that nostalgia! Cannot believe this is only 4 ingredients! NEED. What a great dessert idea! Can’t get much yummier that this! I love that you drizzled natural peanut butter over the top!